Where are all of the guests, you ask? The truth is that you put nearly all of your effort into planning your presentation, and very little to none into the invitation and registration process. As a result, your webinar will not Publishget the attention it deserves. As this example shows, it’s very important to remember that webinars need to be marketed just like any other event. Sure, engaging in marketing tactics like posting a message on your website or social channels can be helpful for increasing hype and reminding people to tune in, but these stand-alone strategies will not guarantee ears and eyes in your next webinar. It’s critical to send official invitations to prospective attendees, along with registration pages, if you want to increase the number of participants. The best way to do this is by investing in a one-stop shop webinar services platform like Onstream Webinars. Onstream Webinars makes it easy to send highly customizable, targeted invitations to attendees along with registration links. The platform also integrates directly with Microsoft Outlook, so invitees can gain access to calendar reminders for events. Onstream Webinars also provides tools for following up with attendees after a webinar, which can help accelerate the sales cycle. 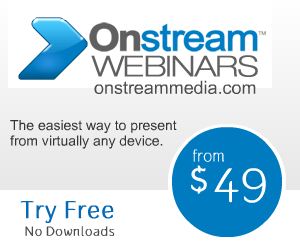 Click here to learn more about how Onstream Webinars can provide your company with the necessary tools for ensuring a great turnout at your next webinar.